Sen. Patrick Leahy (D-Vt.) won another six-year term last November and doesn't face reelection until the year 2022, but his fundraising operation continues to function smoothly. Not so much for his own reelection fund, but for another organization he controls: the Green Mountain Political Action Committee. It's a so-called "leadership PAC," a vehicle for political spending not directly related to a candidate's own campaign. In Leahy's case, much of the proceeds go to help fellow Democrats across the country. It also serves another purpose: The Green Mountain PAC is a catchment for the special-interest money that flows freely in Washington, D.C. It allows Leahy to collect and spend big bucks — in part, to maintain his year-round political apparatus — without tainting his traditional reelection fund. Here's how. On July 15, Leahy's reelection committee filed its quarterly finance report. 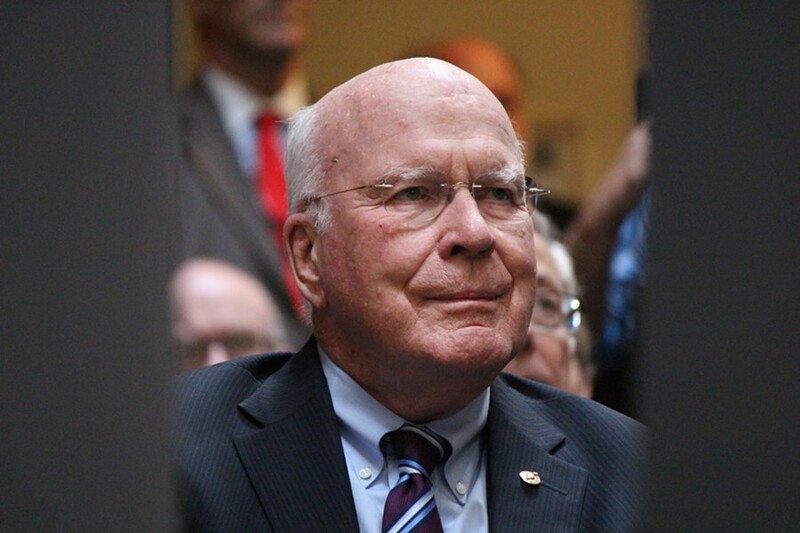 Leahy for Senate collected $32,000 in donations, only $3,000 of which came from PACs. Pocket change by senatorial standards. On July 31, the Green Mountain PAC reported contributions totaling $253,000 in the first six months of this year. Nearly half of that came from corporate and special interest PACs. And when you scan through the contributions from individuals, nearly half of that total came from the D.C. area, mostly from lobbyists, attorneys and others who seek to influence lawmaking and regulatory processes. In short, Leahy's PAC benefits greatly from the senator's position of power, swelling its coffers with top-dollar gifts from special interests and wealthy donors. Of the Green Mountain PAC's six-month take, $122,000 came from (predominantly corporate) political action committees. That's 48 percent of its total. Of the $131,000 in individual donations, nearly $60,000 came from the greater Washington, D.C., area. The bulk of those gifts came from those who work in the federal orbit. Only $23,000 in individual contributions came from inside Vermont. And that $23,000 includes the PAC's only big-dollar donations from Vermonters: a cool ten grand from Jake and Donna Carpenter, owners of Burton Snowboards. On the corporate side, Green Mountain PAC collected $5,000 each from 14 separate PACs, including those representing Home Depot, Honeywell International, General Electric, General Dynamics, Boeing, Northrop Grumman and the American Association for Justice, formerly known as the Association of Trial Lawyers of America. Nice piece of whitewashing there. Not to say that Leahy's PAC ignored the working stiffs of America. The Sheet Metal Workers' International Association, the International Association of Fire Fighters and the International Brotherhood of Electrical Workers each contributed $5,000. Take note of the heavy presence of industries that do a lot of government business and unions that represent their workers. All the military heavyweights are high on Leahy's list. Might have something to do with his vice-chairmanship of the Senate Appropriations Committee. As are entertainment and communications entities which often have issues before the Senate Judiciary Committee, of which Leahy is the senior member. In the leadoff spot is none other than Major League Baseball's PAC, which gave $5,000. Green Mountain PAC also received four-figure gifts from the Internet & Television Association, the delightfully-named Verizon Communications Good Government Club, the National Association of Broadcasters, Microsoft, Facebook, Comcast/NBCUniversal, the Recording Industry Association of America, the Universal Music Group and iHeartMedia/Clear Channel Outdoor. The latter is deliciously ironic, considering that one of its primary businesses is billboards. You know, the ugly things banned in Leahy's home state. Now that we have an idea where Green Mountain PAC got its quarter-million dollars in donations, let's take a look at expenses. Those totaled $212,000 in the first half of the year. Leahy's PAC gave $70,000 to Democratic senators up for reelection in 2018 — $5,000 apiece to 12 different senators and another $2,500 each to four others. It also gave $15,000 to the Democratic Senatorial Campaign Committee, $5,000 to the Vermont Democratic Party and $1,000 to Emerge Vermont, the group that recruits and trains female candidates for office. Otherwise, the expense side of the ledger reinforces the old maxim: You gotta spend money to make money. Leahy's PAC paid roughly $5,100 a month to Campaign Finance Consultants, which does just what its name implies. Leahy's reelection committee also paid $5,100 a month to CFC, so Leahy's twin fundraising organizations are on track to pay CFC more than $120,000 this year. Also getting a healthy piece of Leahy Pie is an outfit called Trilogy Interactive, which counsels politicians and causes on how to use social media. Trilogy received a mere $7,750 from Green Mountain PAC in the past six months, but it raked in more than $50,000 from Leahy's reelection committee. That adds up to a Leahy-related total of nearly $58,000. And then there's Rapid Results, which handles direct-mail and digital fundraising. Green Mountain PAC paid $24,000 to that firm in the first half of this year. The sad thing about all this is, it's simply business as usual in Washington, D.C. There are insane quantities of money floating around among politicians, consultants, fundraisers, corporations, lobbyists and attorneys. Home Depot gave Leahy's PAC $5,000, but it donated more than $600,000 to political causes in six months' time. In the same period, General Dynamics gave $554,000, General Electric $750,000 and Honeywell over $2 million. And Green Mountain PAC's total haul of $253,000 looks puny next to Senate Minority Leader Charles Schumer's (D-N.Y.) leadership PAC, which took in $2.6 million. It's simply the price of admission in modern-day politics. "Senator Leahy is a national leader. It should come as no surprise he enjoys national support particularly in light of his high profile opposition to Attorney General Sessions, the Trump Administration's Muslim ban, discrimination against transgender Americans and the Republicans attempt to repeal and replace health care just to name a few. "Green Mountain PAC supports Democratic candidates. Every day of the Trump Administration is a reminder of the importance of supporting and electing more Democrats." She also noted that "95 percent of the contributors are individuals. 21 percent of the contributors are from Vermont." Which is true; it's just that the contributions from the PACs and Beltway types tend to be much larger than the gifts from everyday Vermonters. Vermont's other two members of Congress, by comparison, were barely on the radar screen. Sen. Bernie Sanders (I-Vt.) doesn't have a leadership PAC and eschews most special-interest contributions. Of course, he can afford his principles; he can raise millions in small donations simply by emailing his massive donor list. Congressman Peter Welch's (D-Vt.) leadership PAC, called Maple PAC, was relatively quiescent in the first half of 2017. It didn't raise any money at all and spent about $5,400. The committee donated $2,000 to Virginia Democrat Tom Perriello's losing bid for governor, and almost all the rest was spent on ... you guessed it ... a fundraising consultant.